It made me wonder: What’s a reasonable timeframe for spoilers in different forms of media? Personally, I try to be aware of the people around me when I’m talking about content that could include spoilers. For example, if I want to talk about something that happened in The Walking Dead, I check with the people I’m with to see (a) if they’re up to date and (b) if they don’t watch it, do they care if I talk about it? When I’m on the other side of things, I can be somewhat anxious about spoilers. When the 7th Harry Potter book was released, I didn’t leave the house or go on the internet until I finished it. For The Force Awakens, I avoided all trailers, and I was legitimately concerned that someone walking out of the theater while I walked in would give away a key plot point. But for those types of things, I tend to watch or read them as soon as they’re released. Any longer than that, and it’s indicative of a lower level of excitement and less of a concern about spoilers. What do you think is a reasonable timeframe to be okay with people openly talking about something that happened on a TV show? A few days? A week? When the season is over? When the season is available on DVD? What about movies? Do they differ from TV? And books take longer to consume than a movie or an episode of TV–does that grant them more time before spoilers can be posted? Or is it never okay to post any kind of a spoiler without prefacing it with “spoiler alert”? 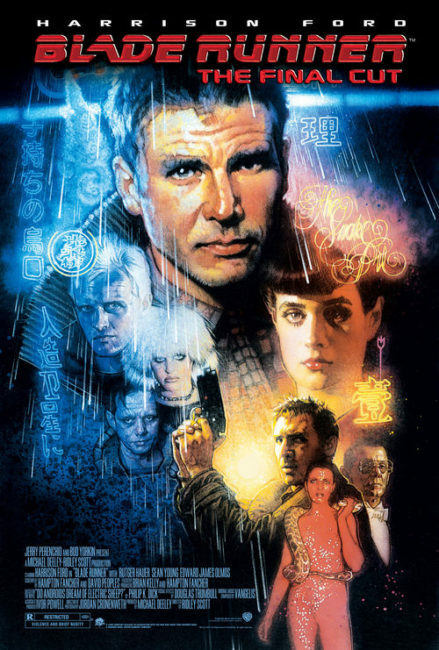 Like, you can’t talk about Blade Runner without checking to make sure everyone has seen it. Is that taking it too far? This entry was posted on Thursday, May 26th, 2016 at 9:52 pm	and is filed under books, movies, question of the day, television and tagged with debate. You can follow any responses to this entry through the RSS 2.0 feed. Good question…this came up just this week for me, as an acquaintance was angry on Monday that he’d been spoiled for Game of Thrones. I wasn’t the spoiler, but I did tease him…saying something like “maybe you should watch it when it airs”. He did not like that at all. Someone involved in the discussion mentioned that a rule of thumb they follow is 1 week for TV shows, and 1 month for movies. I thought that was pretty fair. To be honest, in this day and age of DVRs, and people waiting a whole season so they can then binge watch…I think the onus is on the person not wanting to be spoiled. It seems to me that more and more people expect others to tread lightly around their unspoiled state for an unreasonable amount of time. You can’t expect people to NOT talk about the “water cooler” shows/movies like GoT, Star Wars, the newest Marvel movie, etc. So, I think it’s on you – the unspoiled – to police your own internet activity and such, and not expect people to constantly preface their messages with SPOILER WARNING. When my aforementioned acquaintance took to Facebook to air his grievances, someone gently said, “You now, you were the one to spoil me about The Force Awakens!” He profusely apologized, and then it came out that the “spoiler” the other person was referencing happened 4 months after the movie was released! Crazy. As posted above, I think a week for TV and a month for movies is reasonable. I also think that we all just need to lighten up a bit and enjoy the experience of watching things even if we know what is coming. But I will fully admit that I rarely watch media immediately so I have given up on caring if I am “spoiled” for just about anything, which is probably biasing my opinion. Mike: I like that sentiment–I know I sometimes put too much meaning on spoilers, forgetting that something can be almost just as entertaining even if I know a little bit about what’s going to happen. I think it’s not asking too much to just ask first. It’s another 2.5 seconds of your life to make sure you’re not ruining anything for someone. It has been REAAAALLY hard avoiding GoT S6 spoilers so far and I want to make some time to catch up on it so I don’t have to quickly avoid memes or other stuff. It is the job of the people who have seen to be courteous, and the job of the people who haven’t seen to be cautious.